When the Mayflower left England, three pregnant women were aboard. Two of these mothers were seven months pregnant, one of them just three months along. 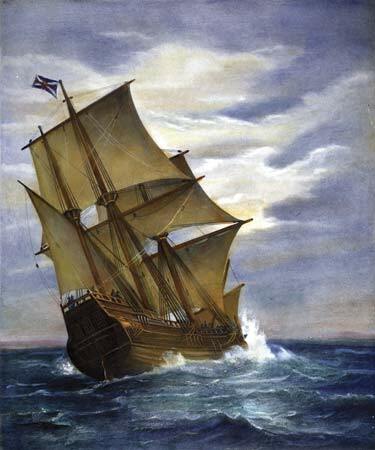 They bravely faced the unknown and left England’s safe haven behind for the New World. One mom gave birth aboard the Mayflower while en route. The second mother gave birth once the ship arrived and had docked in New England. The third mother gave birth a few months later but unfortuately lost her life during childbirth. Her infant son was also lost. Only one child/mother pair survived. The child born while en route was lost during the first harsh New England Winter. Life was very difficult indeed. Strict rules abounded regarding family life and there were little if any resources available to mothers for support and carrying out household duties. More often than not during the first tumultuous years one did not know from day to day if they would have enough food to even survive to the following sunrise. Leaning on faith and God were about all they had. The Pilgrims learned from the local Indians and relied heavily upon the land to provide them with resources. They ate ground nuts, killed local fowl, fished, and began to learn to plant crops with the Indian’s help. 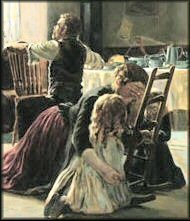 Mothers were expected to be meek and demure, quiet and obedient, faithful and p ure, to love their husbands as they loved Christ and their husbands were to be the Head of Household, to love their wives as Christ loved the Church and function as the religious and moral compass of the household. Children were strictly raised – even playing was seen as a sinful waste of time by the Puritans and children were even forbidden from playing on the Sabbath, perhaps an explanation of why children attended church sermons with their parents that often lasted six hours or more. Prayers were held twice daily, and the Bible was often the first book to which children were exposed. In fact, religion played such a large role in early American life that 80 percent of 17th century New Englanders had an Old or New Testament name. The name was often given at the baptism, something the Father of the family was responsible attending to when the child was two weeks old as “the mother at that time by reason of her travaile and delivery is weake and not in case to have her head troubled with much cares.” Nice to see they realized that mom needed a break even if it was from something as simple as baptizing her child. 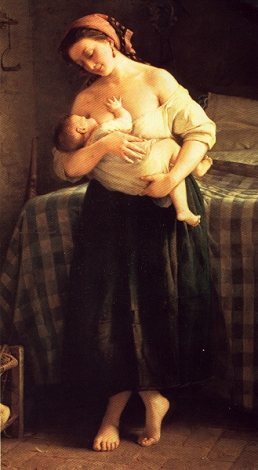 Childbirth in early America was a difficult task as many children and mothers were lost during this time. Even in the healthiest of communities, 10 percent of children did not make it through their first year and three out of nine died before their 21st birthday. Yet families were large and a new child typically made an appearance every two to three years. Cotton Mather, a well known early preacher, saw eight out of his fifteen children pass away before the age of two. This loss came to be expected but still wrought the parents with grief. Puritan belief led that children were born into sin and were not innocent as is now believed therefore the loss of a child would seem to be that much harder – not being able to believe your child has gone to be with the Lord. Pilgrim families had it rough and there is no denying that when you have mounds and mounds of text telling you so. But they survived. They survived harsh winters not knowing how they were going to feed their families. They survived the loss of their children, their homeland, their loved ones, their traditions. But out of this struggle a bright light shone through and enabled them to grip to hope and form new traditions, new lives, new family structures. They adapted and developed new ways of handling whatever difficulties traveled their way. If they hadn’t, we wouldn’t be here today. If you take nothing else away from this article, take away this. Life isn’t about what happens to you. It’s about how YOU happen to life. The next time something difficult happens? Take the Pilgrim way out – dig in, grit your teeth, put your head down, and plow right through it. Tomorrow is a new day and if they did it, SO CAN YOU! This entry was posted in family, infant, life, mom, motherhood, prayer, pregnancy, woman, women and tagged children, Dads, family life, history, moms, New England, Pilgrim Childbirth, Pilgrims on November 26, 2008 by LHale. Meet me at 10am EST for chat! I’m the Guest Chatter over at Pampered Pregger and Beyond today at 10am EST. Come join us! Baby’s here and yet I’m not doing cartwheels – instead I feel worthless, sad, weepy, and irritable and there’s no sign of these feelings going away! Learn how to recognize symptoms of Postpartum Mood Disorders and what to do when it’s more than the blues! We’ll go over how to prepare yourself, your family, and how to talk with your doctor if things aren’t getting better if your symptoms have gone on for more than a couple of weeks. Remember, you are not alone, you are not to blame, and you will be well! This entry was posted in postpartum depression and tagged Guest Chatt, Pampered Pregger & Beyond, Postpartum Mood Disorders, PPD, seeking treatment on November 25, 2008 by LHale. Water is fluid, soft, and yielding. But water will wear away rock, which is rigid and cannot yield. As a rule, whatever is fluid, soft, and yielding will overcome whatever is rigid and hard. This is another paradox: what is soft is strong. 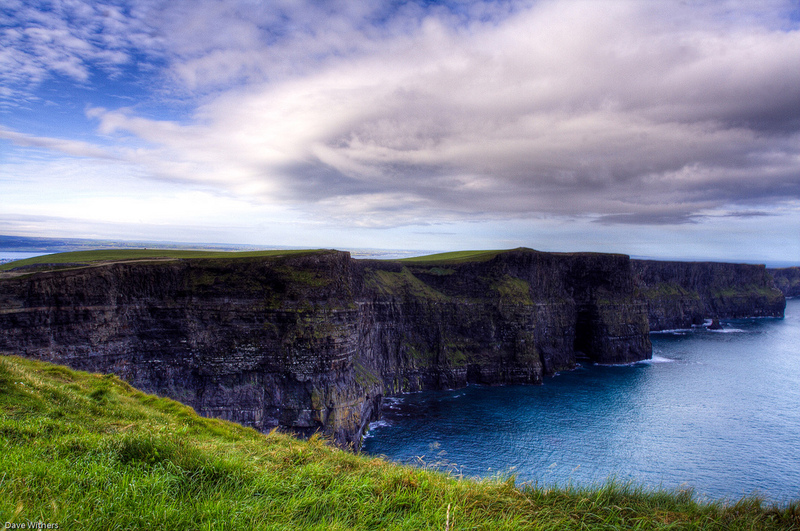 This entry was posted in friday soother and tagged Atlantic ocean, Cliffs of Moher Ireland, friday soother, Lao-Tzu, paradox, water on November 21, 2008 by LHale. Just last week a friend of mine invited me to be part of an absolutely amazing community, Pampered Pregger and Beyond. Tiffani Lawton, formerly of Buoy for Perinatal Blues, is the amazing woman behind this site which combines a little bit of everything you would ever need to know about well, Pregnancy and Beyond. In fact, I’m scheduled to do a guest chat on Postpartum Mood Disorders there next week! I just had to share this with you and send some major kudos out to Tiffani who works very hard at motherhood and supporting other women. Thank you, Tiffani, from the bottom of my heart. Your work is amazing! Tell us a little bit about yourself – who IS Tiffani Lawton? Share a bit of your professional experience as related to pregnancy and postpartum. What have you learned on your journey that defines your approach to women during these times in their lives? No two women are exactly alike. Their needs are so highly individual. My approach to women during their pregnancy and postpartum period is ALL about them. How are they feeling? What are their needs? I have my Mary Poppins bag of resources available to meet their needs and support their feelings. I don’t use a cookie cutter approach. You ran a blog, Buoy for Perinatal Blues. What led you to start the blog? The lack of postpartum support in my area, southern NJ, which I soon realized extended far beyond my own borders. I wanted to help increase awareness about Perinatal mood disorders and offer a place for women and families to find educational support. As a mom, you know that we stay very busy. What do you do to take care of yourself when you have the time to relax? Read and write. I wish that I could say something very romantic, but I love to curl up in my bed, pull the covers up and read. 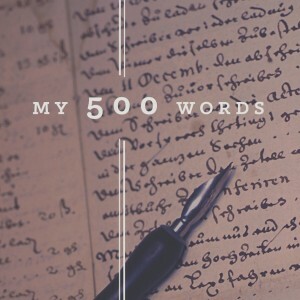 I also love to write, so I really enjoy working on one of my blogs or books that are in the works. What do you find the most challenging in motherhood? For me, the challenge is juggling two entirely different worlds, teens and tots. They both have such very unique needs. The least? My love for them and the pride I feel in their littlest of accomplishments, the ones that define who they are. Name at least three things that made you smile today. 1) my three year old trying to mimic his 14 year old brother’s past theatrical performance on video. 2) hearing the tots little angelic voices in the background while on the phone with my husband who was home with the tots and getting dinner started! 3) watching my 14 year old play Cruella Deville on the piano while my 2 year old sat next to him, pretending he was playing too. You are a certified antepartum and postpartum doula. Would you share a bit about what a doula is and how a doula can help a woman and her family during pregnancy and the postpartum period? An antepartum doula generally assists pregnant women who are classified as high risk, who may or may not be on bedrest, or with medical conditions necessitating the need for help. This assistance includes education and physical support such as bed rest assistance, sibling care, errands, meal preparation, home care, and emotional support. A postpartum doula assists the new mother, baby, and the family within the first few weeks after the birth of the baby. I like to keep the offer of support open through their first 12 weeks and beyond if needed. Postpartum doulas are knowledgeable about newborn care and breastfeeding. The postpartum doula may offer the following: breastfeeding tips, baby care and advice, household help, sibling care, meal preparation and run errands. Cesarean Support and Awareness is also very important to you. Would you share some of your experience with cesarean birth as well as any resources for moms and families to turn to for information and support? I personally have had 4 cesareans because I had pre-eclampsia with all four pregnancies. I did labor for 52 hours with my first, which stalled and resulted in an emergency. I was not permitted to VBAC with my second and I was emotionally devastated. The third cesarean was at 37 weeks because my kidneys could not bear the load and the 4th was scheduled due to complications. The fourth nearly killed me. The incision became infected and then took 8 months to completely heal after multiple rounds of heavy duty IV antibiotics on a daily basis. Because of the delayed healing and decreased mobility, I developed a pulmonary embolism which is a blood clot in the lung. I am lucky they caught it in time or my children would have all been left with out a mother. Moms and families seeking support can look for a local ICAN Chapter in their area. ICAN, International Cesarean Awareness Network, is a great resource and I learned so much from them. I started a chapter in my area, but have since changed it to Cesarean Society within Pampered Pregger & Beyond. Cesarean Society offers an online educational and supportive resource for mothers on their journey through recovery. The support group features monthly chats with guest chatters, ongoing forum discussions, online book club, and coming in 2009 will feature telesupport groups and talk radio. Overall, Awareness, Support, and Education for women during the pregnancy and postpartum period has improved drastically over the past few years. In your opinion, what obstacles do we still face and what can the average mom do to improve her own experience during the these times in her life? I agree, awareness, support and education has greatly improved, all of which empower women to be their own advocates. Knowledge is power. However, obstacles do remain. Midwifery needs to come to the forefront again and be the first professional that prenatal women seek. All pregnant women should watch The Business of Being Born. An insightful article, A Birthing Option To Be Mirrored, further explains how obstacles can be removed. The Mother’s Act needs to get passed into law which will further increase awareness and professional education for doctors and nurses. If the professionals respond at all, all too often the OB or the GP will give out an anti-depressant to a new mother complaining of depression and it may not be the appropriate medication for her. They are not experts in mental health. I would love to see a mental health nurse practitioner be connected to every OB, so that when a mother expresses her concerns, the OB can refer that mother to the right person. The right person will help the new mother explore a variety of therapeutic options, not just medicinal. Last but not least, you have an opportunity to give an expectant mother (new or experienced) one piece of advice. What would you say? Postpartum planning! A postpartum plan is so very important and the plan will change with each new baby as the circumstances have changed. Informative article entitled, Are you Prepared ? is a great resource. This entry was posted in family, infant, life, mom, motherhood, postpartum depression, pregnancy, woman, women and tagged Add new tag, Buoy for Perinatal Blues, ICAN, labor doula, Pampered Pregger and Beyond, postpartum doula, Postpartum Mood Disorders, pre-eclampsia, Tiffani Lawton on November 20, 2008 by LHale. Self-Care is the most important care of all! I know I’ve been slacking on the blog. Not posting as much as usual. This is because I have been practicing what I preach. I have been taking care of myself and my family – all other projects have been put on the shelf and are only worked on as I can get to them. We’re all still a smidge under the weather and to top things off, we’ve now joined the ranks of millions of Americans in the unemployment realm. We understand cut-backs needed to be made. We’re not angry. In fact, we see this as a door opening rather than closing. Both of us have a wonderful sense of peace surrounding the entire situation. That being said, my family and myself will always come first. So if you’re a regular and I don’t post for a few days, send a prayer or two our way and know that I will be back when I get a chance – haven’t forgotten about you – merely walkin’ the walk! This entry was posted in family, life, motherhood and tagged apologies, God, prayer, regular, self-care, stress, support, unemployment on November 19, 2008 by LHale. 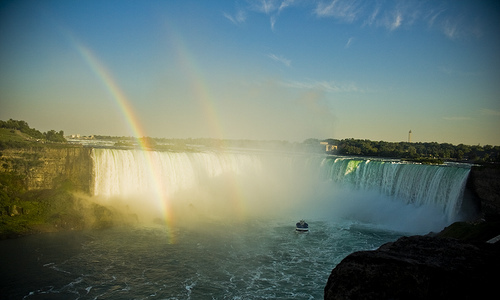 This entry was posted in friday soother and tagged courage, Mary Anne Radmacher, niagra falls, quiet voice on November 14, 2008 by LHale. Chris hurt his ankle on Friday. Alli, Charlotte, and I are sick. Chris tore ligaments in his ankle and is on crutches. Alli has Bronchitis and can’t return to school until Wednesday, Charlotte has the beginnings of Bronchitis, and well, I guess I’ve got the same thing. I can hardly hear due to congestion. I’ve been going to bed every night around eight or nine for the past few nights. Hopefully things will start looking up as the girls get started on some meds and I get rid of my congestion. I’m tired. On a more positive note, the kids and I went to the local zoo on Saturday. We had a blast and saw all of the animals except for the turkeys and the bears. We also went and saw Sanford Stadium – the girls were SO excited to see where the Georgia Bulldogs play! Hopefully I’ll be able to get this blog back on track in the next couple of weeks but for now please bear with me as our family recovers! This entry was posted in family, life, motherhood and tagged ankle, bronchitis, cold, life, sick on November 10, 2008 by LHale. 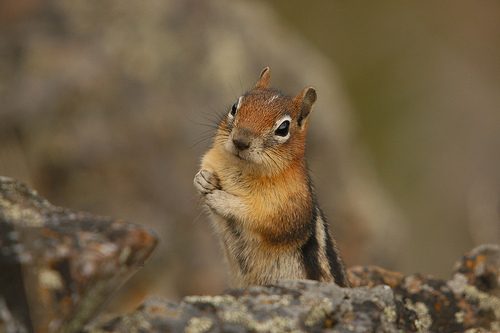 This entry was posted in friday soother and tagged chipmunk, curiousity, walt disney on November 7, 2008 by LHale. Wendy Davis is the glue that holds all of us Postpartum Support International Volunteers together. She is an amazing woman and I have come to enjoy her friendship and support. Since embarking upon my peer support journey, Wendy has been more than willing to answer any question I may have and has encouraged me the entire way. It’s almost been like having a personal cheerleader! I know that I can take anything to Wendy and she will not only listen to what’s going on but aid in coming up with a solution that will work for all involved. Wendy does absolutely amazing work each and everyday and for this, I thank her. I am honored to post her interview today and hope you enjoy reading! Tell us a little about yourself – What makes you tick? I am married and a mom of two children who amaze me with their wisdom and humor. I was the 4th out of five myself, and then had 4 stepbrothers. I thrive on relationship even though I am by nature an introvert. How did you get involved in Postpartum Depression work? What drew you in? I had postpartum depression and anxiety after the birth of our first child in 1994 and I had no idea what was happening to me. Every negative theory of depression crowded into my anxious brain, and I could only believe that I was a complete failure and that my life was ruined. I thought I had made a terrible mistake by deciding to have a child. I had already been a therapist for 14 years when that happened, and had specialized in depression, anxiety, and grief. But nothing had prepared me, no course had taught me, and I was completely ashamed and frightened. When I did start to understand that I had postpartum depression, I found very few pictures of hope and healing, and that scared me more. After I recovered I was compelled to learn everything I could and to make a real difference for other women and their families. I wanted to make it safe for them to reach out. I didn’t need to reach big numbers, I just wanted each woman and dad that to know that there was hope for them. I wanted to help them learn to see their strengths and healthy instincts. After I had our second baby three years later, and I didn’t have a repeat PPD, I was even more motivated. As a Mother, how important is it to remember to care for yourself? What do you do to recharge your batteries when they’re down? I feel like it’s a continuous practice to remember to take care of myself. It’s not enough to just know I need to do it – I need strategies and reminders. And if I’m lucky, I get positive reminders like feeling good or having a friend ask me out, not negative reminders like getting sick or cranky. I recharge my batteries by taking walks in the beautiful Oregon mist, listening to music, going to visit my mom at the coast, having dinner with my sisters, brother, and their kids. And now that my kids are at the wonderful ages of 11 and 14, I really do recharge by being with them. That’s a great surprise! What do you find the most challenging in motherhood? The Least? The most challenging thing for me on a daily level is scheduling time for myself. The challenges change as kids get older: when they were little, the biggest challenge was having patience when I was frustrated or angry with them. I learned a lot about conflict management and how to express my frustration and anger by working on that. Another challenge is that it’s hard to make time to have dates with my husband or my friends. The least challenging? I seem to have a lot of tolerance for their individuality and creativity and it has always brought me joy to see them express themselves even if it’s … unique. How did you get involved with PSI? I had started the Baby Blues Connection in Portland and of course I found PSI as the main clearinghouse for information and support. At first, to be honest, I wanted to do it myself and didn’t know if I needed PSI. (PPD Risk factor: off the chart need for self-sufficiency.) All it took is one conversation with PSI founder Jane Honikman. I wanted to know her, to learn from her, and I felt immediately welcome and encouraged. That was in 1997, after my daughter was born. I became the Oregon Coordinator that year. In 2005 I volunteered to be the Coordinator of the State and International Coordinators and then I joined the PSI board as the Coordinator Chair. I love our PSI volunteers and I am immensely proud to be volunteering with them. Awareness of Postpartum Mood Disorders has come a long way. In your opinion, what are some obstacles we still face in gaining even more acceptance and reliable treatment for new mothers who struggle with this? There is less of a taboo than there used to be, but shame and fear still exist. I think that it’s hard for people, providers and the public alike, to have positive images of healing and recovery. Our local and federal policy-makers still have the habit of ignoring the needs of new mothers. It’s the same challenge WE have! I am optimistic though, and remain undaunted. Every challenge I see is another opportunity for education and communication. I used to be angry that people didn’t get it; now I’m just busy. How important is it to have the entire family involved in Mom’s recovery? What can family members do to create a supportive and positive environment around her during her journey towards recovery? It is essential to have the family involved not only in Mom’s recovery but in the prevention of a crisis. Family members can first gather information for support and care before there is a crisis. Every family that is planning to bring home a new child needs to know where to turn for help if they need it. If mom is struggling, family members can be most helpful by believing in her strength and recovery, and truly listening to her when she is able to tell them how she feels and what she needs. In the beginning, most women don’t know what to ask for. At that time, family can just stay present, don’t judge her, don’t scare her, but tell her you’re there for her all the way through. You currently serve as the Volunteer Coordinator Chairperson for Postpartum Support International. What advice would you provide to those who wish to provide support to women with Postpartum Mood Disorders? What is most important to remember when embarking on this endeavor? If you want to provide support for other women, the first step is to check in with yourself to make sure that you are taking care of your own needs. Contact PSI to find out what is going on in your area and how you can become involved. You can contact the office or go to the support map and find your area coordinators. Learn about the great service of social support and what that means. Read through Jane Honikman’s website as well. It is not giving advice or recommendations; it is being a peer who can listen and help women learn that they are not alone, it is not their fault, and there is help. Name three things that have made you smile today. This question. Voters. My daughter made a necklace out of a peace sign. Last but not least, you have a chance to share with an expectant mother (new or experienced) some advice regarding Postpartum Mood Disorders. What would you share with her? Don’t be afraid to reach out. Know that it is a statistical risk factor to be a high-achieving, self-sufficient person and that it might not come naturally to you to look for support or help. It is a great new skill and made the biggest difference for me between my first and second postpartum experience. What we survivors have learned is that the new strength is the ability to ask for help when needed, even before it’s needed, and to take it in. If you are struggling now, know that you are not alone and that you will get better if you stick to a plan of self-care and recovery. There are many options for treatment – choose what works for you. The universal aspect of recovery is the connection with hope, coming out of isolation, and knowing that you will come through this no matter how severe your symptoms are when most acute. If you need help, we are here to help you find what you need. This entry was posted in family, infant, life, mom, motherhood, postpartum depression, pregnancy, strong woman, woman, women and tagged Jane Honikman, motherhood, peer support, Postpartum Support International, PSI, Wendy Davis on November 6, 2008 by LHale. Take your child(ren) with you to Vote! Seriously, studies show taking children to vote with you, or even having them help fill out the bubbles of your absentee ballot on the kitchen counter, helps them become regular voters when they grow up. So by bringing a child to vote, you are not only turning in your own vote in the present moment, you’re also building our future democracy. Remember to have fun on Election Day–make voting a snazzy field trip, a dramatic moment of power, a snapshot in time to recall in later years. – – In addition, CNN has a voter hotline to call if you encounter any problems voting or know of a problem: 1-877-462-6608. This entry was posted in family, life, mom, motherhood, woman, women and tagged awareness, democracy, education, Election Day, momsrising.org, MomsVote 08, Vote, women on November 4, 2008 by LHale.